The planet she wobbles, the orbit is never exactly (precisely) the same, we are whipping through space at about 1800mi per/h (guessing on this) and we’re 70% water surfaced. We’ve cracked up ocean floors, constantly moving continents all around ANYONE claiming they know that they know 100% for sure that a 03% of a 3-4% Carbon gas in our atmosphere is the DRIVING force of our planet is just plain…. well not thinking clearly. Then there’s the gigantic ball of hotness that we gravitate around – it has its own variations. Moon lapping us as it slowly moves away from us. Universe is always a changing! It’s a ponzi scheme by UN. BBC, Guardian and etc all have invested in carbon markets, reportedly their pension funds – can’t trust media people who are so heavily invested in a lie. Most can barely forecast the next weeks weather accurately and yet the money grabbers claim they know what the climate will be in 50, 100, 150 yrs? Pollution is one thing, but climate is a completely different matter. How is it helpful for my Canadian plastic bottle to be shipped to places in lower tropical Asia for melting down? Who’s watching them and how they process all this toxic run off? Not to mention the massive amount of energy it takes to get that plastic bottle there…insanity. Think those barge operators care if some plastics falls into oceans? Are they filtering their diesel fumes? We should burn it for energy here and filter the exhaust like they do in France. France also runs on Nuclear energy. Some personal irony. Since our govt taxes us like crazy on electric heat (hydro bills are 3-4 times what we consume) the rest is GREEN TAXES so we now burn wood all fall, winter and spring to stay warm and out of poor house for the last 6 yrs. We cut our own trees down now every year and buy more if we need it. Wouldn’t be doing this if we only had to pay for what we actually USE. Blue box has kindling in it as I feel awful that any of my plastic goes in the oceans! Metals, tin and etc. go to a pensioner who sells it for money and paper we use to light fires in wood stove. It’s -25 C here now…wood stove is working quite well as inside it’s 23-24 C our home. One thing is sure and that is, as the price of energy increases, we will all get poorer and poorer. Well yes, mainly the lack of any reference to research and known facts. Maybe what you say has some logic, but if it is completely out of your head I cannot give it a lot of credence. You may have noticed that I always attempt to back up any of my assertions with either absoluely provable or empirical facts or academic papers. I would not dream of publishing in any media let alone a humble blog without adequate references. Well you asked what I found wrong in your posts – no hard feelings. I am quite capable of judging where truth lies and I base that judgment of well researched facts of which academic papers are one source. I suggest that YOU try to base your conclusions similarly if you want any credence around here. For instance people who have taken on the AGW religion operate very much in the same way that you are right now, and for example even manage to out sensationalise the IPCC’s writings, (Their bible), which itself is prone to exaggeration and hyperbole. So please calm down a bit and say something sensible or not at all. It is only with great reluctance do I ever spam comments on this blog. Get off what you are smoking mate, you ‘leave’ in Australia? It is pointless and nonsense you are communicating. I don’t believe you are a skeptic, because you would NOT use the word denier if you were. Ignore him Roger. He’s a troll. I think he got kicked off WUWT too. bushbunny, I like your name. Stephan I believe we have met you on WUWT. It would not be surprising that during the medieval period, that Europe was more heavily populated that North America, (other than indigenous natives) South America, Australasia, and most of the South Hemisphere. And the Northern Hemisphere would have been affected by the cold more than the South as they grew crops and grapes. I can’t be bothered arguing with you. Has anyone heard of the Medieval Warm Period? was the title of the post and don’t be sarc as I have heard Greens say the Mini ice age was not true. When there is evidence this was the fact. bushbunny, we are not arguing, we should debate, see: I wasn’t talking the effect on agriculture – I was pointing that: by the laws of physics, the WHOLE planet cannot be colder, or warmer than normal for more than a day – therefore – when was LIA in Europe and north America – southern hemisphere was warmer than normal – the laws of physics say that, not me. I’m not a Warmist and never will be, I’m not ”skeptical” – because when i don’t know something, i research, or ask for advice. I don’t go to wiki for misinformations. I’m denying that is any GLOBAL warming, because it isn’t and i have proven that it cannot be. You ask Anthony to debate me; if he has stomach for real proofs. ps Now I expect you to quote some text or paper that I can look up. P.s, on the ”Scottish blog” I gave you same post twice, by mistake – the second post I’m recommending here is the one to check and replace your blanks – then warmist will start taking notice of you – they are clever, they know what you know – you are doing the dirty job for them. Read those two posts and will be like turning the lights on, for you. All way above my head, but thanks for dropping by. Roger I have missed this thread, what is this stefanthedenier on about? I have heard of the MIA, but not the MWP. But it makes sense that definitely before the MIA it was warm enough to grow grapes and wine production in England, then cold North winds ruined crops not only in England but also in Northern Europe. However they turned the grape presses into printing presses. When I left UK in 1960 to live in Cyprus the only grapes being grown where in Green houses, and British wines were unheard of but it seems to change back again. The wine ain’t good either, so someone told me. MWP means the medieval warm period and LIA means little ice age, but apart from that, like I said he is over my head. You’ll be pleased to know, even without Gores surprise visit to Canberra and interviewed with Clive Palmer, the lower house passed the repeal of the carbon tax and mining tax. It will get through the senate with the help of those senators that belong to Clives crew and cohorts. But the clean energy bank is still in question. That’s why Gore came and it snowed and snowed. I hope he brought his long johns. You say “I’m with the church on this one”, but I see the main-stream churches falling for the CAGW scam hook line and sinker, so siding themselves with the human-hating environmentalists. Like I say, I’m with the church on the issue of who controls or can control the climate. I make no claim any further than that in the text. Hi Roger, I only just discovered this site through your latest comments on quakerattled which I fear may yet be deleted by Rachel. My friend, DouglasS, and I have given up commenting on her site simply because she started to censor views which she regarded as attacking the “settled science”. People who have to censor have already lost the debate in my view. Many of her regular supporters also resort to vile, ad hominem attacks whenever alternate viewpoints are put forward for debate. No worries Eve, Rachel is a prime candidate for my other blog http://www.globalwarmimgsupporter.wordpress.com where I deal with people like her. As for myself, I will believe anything if there is reasonable proof. Rachel’s censoring and ad hominem attacks are typical for someone who is believing on faith instead of fact, so I entirely agree with you there. Are you from Christchurch? Please feel free to have a read and to leave a comment. It is a chance for you to repeat your spammed messages that you left on quakerattled of you wish. Anyway I hope its at least worth a visit. Thanks, Roger. Will have a look later today. I followed yours and other comments at the time but will have to get back into the swing of the debate. I notice your reference at the end of your article to the petition project and I too was curious about the number of scientists who signed the Oregon Petition. What I found out about it is that the link http://jcmooreonline.com/2010/01/29/the-oregon-petition-how-can-31000-scientists-be-wrong/ . Your readers should find the article interesting. I could tell by your comments that you very carefully read Plass’ paper and you wrote a very good critical analysis of it. Plass’ work followed the methods used by Kaplan, who a few years earlier did a similar analysis of the upper atmosphere by using hand calculations to do the integrals. Kaplan considered only the upper atmosphere as that was a simple enough system that he could do the integrals by hand. His work is highly regarded by skeptics as he found that adding CO2 the upper atmosphere had a cooling effect. By 1956, computers were available, so Plass was able to use numerical methods to do the integrals layer by layer down through the troposphere to the surface. He found that doubling the amount of CO2 in the atmosphere would raise the temperature of the surface by 3 to 4°C. That was a surprise in light of Kaplan’s work but it makes sense, as retaining thermal energy near the surface would cause the upper atmosphere to cool – as it is warmed mostly by infrared radiation from below. You are correct that Plass made a number of assumptions to simplify the calculations and also because the spectra of water and CO2 were not completely resolved at that time in areas of the spectrum where they overlapped. However, Plass had the fundamental factors right and his work has been confirmed by experimental evidence as the amount of CO2 has gone up by 37% and the temperature of the surface up by about 0.9°C , well in line with his work. His work has also been confirmed by later calculations that used much better models of the atmosphere and used well resolved spectra of CO2 and water vapor, such as Kiehl’s and Lacias’ papers use. Clouds are not usually considered in the models as there are many kinds of clouds at different altitudes and they are not uniformly distributed. Clouds are part of the feedback loop to the rising temperatures caused by increasing CO2, and the overall effect seems to be that they have an overall positive contribution to global warming. Climate scientists would like to pin down a little better the overall effect of clouds and there has been much interest in the area. Some mention is made of that in the articles referenced below. I have looked at historical records of climate change and the natural factors that influence the Earth’s temperature. Articles on those are at http://jcmooreonline.com/2010/11/12/is-global-warming-naturally-occurring/ and http://jcmooreonline.com/2010/12/31/science-global-warming-and-the-ice-age-mystery/ . However I really need to point out that you have consistently avoided the questions put to you in my comment of 2011/09/02 at 6:14 pm . First of all I think you should read the comment again, try and grasp what it is asking and then be honest with yourself as to whether there is an answer that is consistant with your thinking and beliefs of which you write so profusely. I might add that these are perfectly reasonable SCIENTIFIC questions and deserve a proper answer. If you are unable to answer them, then I suggest you rethink your beliefs because you are chasing yourself up a tree. Don’t you at least know the difference between correlation and proof? Finally, since I spent so much time reviewing many of the papers you sent me, which I might add turned out to be irrelevant to my actual questions, I suggest you spend some time reading the following document equally as carefully. While you are right that correlation does not imply causation, it is true that causation does imply correlation. Plass’ work uses well accepted ideas and methods and clearly shows that there is a causative link between increasing CO2 and the Earth’s temperature. His theory has been confirmed by many other researchers since that time and it is rather amazing that work that he did over 60 years ago agrees quite well with the experimental evidence that we are observing today. In science, it doesn’t get much more convincing than that. I do not seem to be answering your questions to your satisfaction. I have tried to focus on the sound scientific theories and the experimental evidence. I hope that you will also focus on the evidence and remain respectful to those who disagree with you. I tried to have a look at the address you gave me at http://www.globalwarmingsupporter/ but that link and variations on it don’t work. Do you have a correct link for the site? Are you being silly or something? Correlation is a necessary condition for proof as I think I pointed out earlier. Correct, you have not even attempted to answer my questions which are aimed at the very foundation of truth. In your last answer, you have even forgotten to provide authority and references to support your somewhat sweeping assertions. e.g. ” His theory has been confirmed by many other researchers since that time and it is rather amazing that work that he did over 60 years ago agrees quite well with the experimental evidence that we are observing today.” You seem unable to see past a doubtful correlation and keep calling it proof. In my previous comments, I have stated what would constitute scientific proof in this case, but you won’t find a paper that contains those things, because there isn’t one! Of course I focus on the evidence! You are the one beating around the bush! Now read the book I mentioned in my previous comment, I am sure you can afford USD$4.99. All the information and facts in that book are verifiable, which gives it some authority. If you don’t like what it says, spend some time verifying or otherwise some of the facts contained therein. If you are afraid to read it, well you had better sneak away somewhere and hide, because this would show that you do not believe your own assertions. The link is probably http://www.globalwarmingsupporter.wordpress.com Its where I archive conversations like this. No one has provided me with reasonable proof yet. Thats why I maintain that there is none. Hi all, as you know it’s Al Gore’s reality 24 hr reality show. But this has been released and you can download it free for today. Maybe after too. Hi bushbunny, thanks for the heads-up on the A/V. For me it nicely sums up the debate about the Catastrophic Anthropogenic Climate Change (CACC) hypothesis I’ve passed it on to associates who are supporters and sceptics of the hypothesis and hope that it encourages open-minded debate. Sorry about my error in referring to Jo Olson as “Professor”, he’s a PE. Hi Dr. Moore, I don’t recall ever starting any comment or post with “Human Induced Global Warming is the biggest crock in all of history.” but it looks as though you are getting mixed up by who says what. Maybe you have the same problem with the CACC hypothesis. I have put some quite simple scientific questions to you without getting any worthwhile response from you, which tends to make me puzzled about your area of scientific competence. You claim to have an interest in spectroscopy and at present I am exchanging E-mails on the subject of that “back radiation” question. If you have competence in that area then perhaps you’d lie to join in. Those included in the E-mails are Dr. John Nichol, former Dean of Science at James Cook University Queensland (a skilled spectrometist I believe), Chairman of the Australian Climate Science Coalition; Roger Taguchi, retired science teacher (like you) with expertise in spectroscopy (unlike you? ); Colin Davidson, science enthusiast; Professor Jo Olson, PE (http://www.canadafreepress.com/index.php/members/1/Joseph%20A%20Olson,%20PE/); others like Dr. Tim Ball, past Professor of Geography at the University of Winnipeg and several of his fellow authors of “Slaying the Sky Dragon” and executive members of the embryonic global science association Principia Scientific International (http://www.gofundme.com/1v39s). Two more experts (from the University of Wisconsin-Madison) have just been invited to participate, Dr. Grant W. Petty, Professor of Atmospheric Science in the Atmospheric and Oceanic Sciences department and Dr. Robert Knuteson of the Space Science and Engineering Center, and the textbook was written by at the University of Wisconsin-Madison. I’m sure that any expertise in this area that you can offer would be most appreciated. Here’s the challenge Dr. Moore, show us how much you know about spectrometry by adding to the discussion. All that I need is your E-mail address and you can prove that you are able to do more than just parrot what real scientists say. You can send it to retep.yelder@gmail.com. Please ignore “, and the textbook was written by at the University of Wisconsin-Madison” which was a hangover from another communication. Sorry I can’t answer all your questions, but as I pointed, out many of them are out of my area of expertise and many of them were asked just for the sake of arguing. It appears you want to argue from a perfectionist position – that if you can find one small thing that I don’t know, you may reject all the things that I say which disagree with your ideological position. When you start your post saying “Human Induced Global Warming is the biggest crock in all of history.”, your ideological position is established, and it is very unlikely that any reasonable argument will make any difference to you. I posted several references in response to Roger’s question about the link between CO2 and global warming. They are true whether the medieval warm period existed or not, and I would suggest that you read them if you really want to understand. Hi Roger, having had one-to-one discussions with several “experts” in the ice core record (e.g. Severinghaus, Alley, Frank, Jaworowski, Nisbet, Dr. Raynaud, etc.) during the past couple of years I recently started up a group E-mail exchange with them on the issue of the validity of the ice core record. Initially I am trying to focus on size-dependent fractionation of CO2 in deep firn as it approaches close-off but ultimately would like to look at all of the possible processes that could distort the record, from the starting point of an ice sheet – falling snow – to the final stages of ice-core disintegration and analysis of the extracted air. I initially included Professors Michael Bender and Eric Wolffe but both have opted out of the exchanges. There are others who have appropriate expertise and I will be inviting them to participate. Several others, like Ferdinand Engelbeen, are mainly “lurking” as Ccs so are you interested in being added to the participants, even just as a “lurker”? Many viewers were simply “lurking” during the exchanges with Eric Wolff on the University of Cambridge’s Naked Science Forum “Another Hockey Stick Illusion?” thread (http://www.thenakedscientists.com/forum/index.php?topic=38675.0) but I expect that they were learning as much as I was. That thread was prematurely locked by the forum moderator Yor_on, a confirmed supporter of the CACC hypothesis whose biased moderation cut short a very interesting discussion. He mustn’t have appreciated the challenge to his beliefs. Taking into consideration all of the scientific uncertainties that persist perhaps it is time for scientists involved in research relating to climate change (which includes those involved in trying to reconstruct past atmospheric composition from air recovered from ice) to be somewhat more modest in their claims about the Catastrophic Anthropogenic Climate Change (CACC) hypothesis and in their rejection of the opinions of others who disagree with them. The power-hungry, politicians and environmental activists have made the debate about the numerous scientific disciplines contributing to our poor understanding of the processes and drivers of the different global climates into a political debate, with all of the distortions of truth that they are renowned for. The UN’s IPCC is the figure-head for this. Another fact about scientists is that they are not gods but merely humans with a little more knowledge that most in specific areas. Scientists are driven by the same basic motivations and failings as most of us, such as self-preservation, self-esteem and a desire to be noticed and respected, etc. etc. etc. These human motivations and failings can have a detrimental impact upon their search for scientific truth and how they present it to others. There have been many factual reports of cases where scientists have distorted the evidence in order to enhance their own individual standing in society. It is unfortunate that absolute honesty is not a pre-requisite for scientists, as the words of a scientist who was highly respected by staunch supporters of the CACC hypothesis make clear. In 1989 The Detroit News had an editorial starting QUOTE: On the one hand, as scientists we are ethically bound to the scientific method. … On the other hand, we are not just scientists but human beings as well. … To avert the risk (of potentially disastrous climate change) we need to get some broad based support, to capture the public imagination. That of course means getting loads of media coverage. So we have to offer up some scary scenarios, make simplified dramatic statements and little mention of any doubts one might have. …Each of us has to decide what the right balance is between being effective, and being honest. –Stephen H. Schneider, author of the book Global Warming (Sierra Club), in an interview in Discover Magazine, October 1989. UNQUOTE. This tells me that in Schneider’s opinion scientists were not obliged to tell the truth but that he only hoped that they would. I find that very disappointing coming from a scientists of Schneider’s stature (more of that at http://www.john-daly.com/schneidr.htm and I can rant some more on this if you like). Another example is the dubious statistical manipulations used by Professor Michael Mann et al. 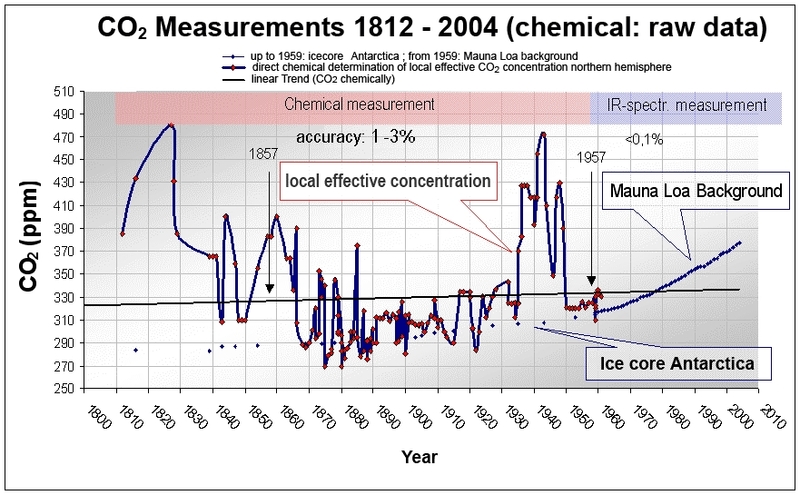 in order to produce the infamous “hockey stick” that so delighted the authors of the IPCC’s TAR (http://www.grida.no/climate/ipcc_tar/wg1/pdf/WG1_TAR-FRONT.pdf). Thanks are due to McIntyre and McKittrick for exposing that “trick”. 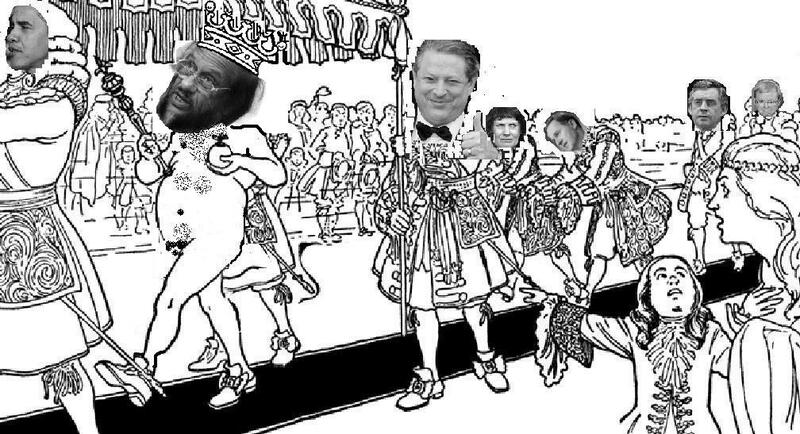 Then in 2009 we had the revelations of Climategate indicating that some significant scientists closely connected with the UN’s IPCC had chosen for 19 years to be what they considered to be effective rather than truthful. Thanks to Andrew Montford for his excellent book “The Hockey Stick Illusion; Climategate and the Corruption of Science” (http://www.amazon.co.uk/Illusion-Climategate-Corruption-Science-Independent/dp/1906768358). Please don’t anyone bother responding on the lines that several enquiries cleared those scientists – there are different shades of “independent enquiry”, especially where politicians are involved (http://globalpoliticalshenanigans.blogspot.com/2010/09/can-there-be-independent-investigation.html). It was after this “rant” of mine that Professor Bender opted out. I’ve made frequent reference here to the University of Cambridge’s The Naked Scientists because I expect organisations and individuals purporting to present science to do so in an unbiased manner, presenting facts where possible and opinions as a last resort. I hope for an honest admission of any uncertainty, in a nut-shell, science, not propaganda. Dr. Chris Smith, Founder and Managing Editor of The Naked Scientists, introduces himself as “ .. a Doctor and scientist here at Cambridge University .. ” (2009 http://www.youtube.com/watch?v=getkpXEX0XY). He goes on to say “ .. what we try and do is strip down science to its bear essentials and make it fun and interesting but also scientifically rigorous and educational .. we are trying to reach audiences that perhaps other science programs overlook .. ”. These are very important and worthy objectives, contrasting with the view expressed by Professor Stephen Schneider that I quoted above. Dr. Smith goes on to say “ .. The idea is to give people a quick snapshot of what’s hot each week in the world of science .. each program is themed so we’ll look at an important aspect of science each week and we invite .. guest scientists to come into the studio and talk about what they do and what their science is all about .. What I hadn’t been prepared for though was quite how much this was all going to cost .. ”. Once again that evil thing “money” rears its head. Sceptics are often accused by CACC supporters of being funded by the evil energy industry. What about the funding of those who support the CACC hypothesis? I am investigating the sources of funds for the University of Cambridge’s The Naked Scientists and have used the UK’s Freedom of Information Act to get details. It’s very revealing – more on that later if you are interested. Hi Dr. Moore, I hope that your family problem isn’t causing too much unhappiness and that things improve soon. I’ve just checked through you most recent 1160 words and once again find your comments somewhat lacking in science. It is claimed that you “ .. taught chemistry, physics, and general science at the college level for 38 years .. ” (http://water.thinkaboutit.eu/think5/blogger/moore) but your comments here and on your blog remind me of one of my teachers who simply handed out textbooks to students to read while he read his newspaper. Several questions have been put to you here and you have shied away from giving a scientific response to all of them. That tells me that you don’t know the answers, which is fine as there is no shame in ignorance – but why not just admit it? – “ .. Please can you provide a link to the evidence .. ” supporting the claim of a positive feedback effect. – “ .. can you explain it for me? .. ” what makes mixed gases move from one container to another. I can find no answer to them. What has “I assume that you are familiar with the ice core data, which also provides records of dust particles and methane. Obviously, you cannot tell the water from a feedback loop from any other water in the ice. However, the vapor pressure of water depends only on the temperature, and if you look at the vapor pressure/temperature graph you can just look up on the chart how much additional water vapor would be in the air.” to do with either question? – you said “ .. In the past there was an approximate equilibrium by the amount of CO2 emitted by animals and other sources and amount of CO2 used by plants than plankton. That equilibrium has been upset by the fact that man is digging up fossil fuels and putting CO2 back into the air that has been buried for millions of years. The CO2 man is emitting has upset the equilibrium and it is now building up in the air .. ”. – I said “ .. Then of course it is necessary to remember that those figures are estimates only and I’m sure that with your detailed knowledge of the subject you’ll be able to provide a figure for the error .. ”. 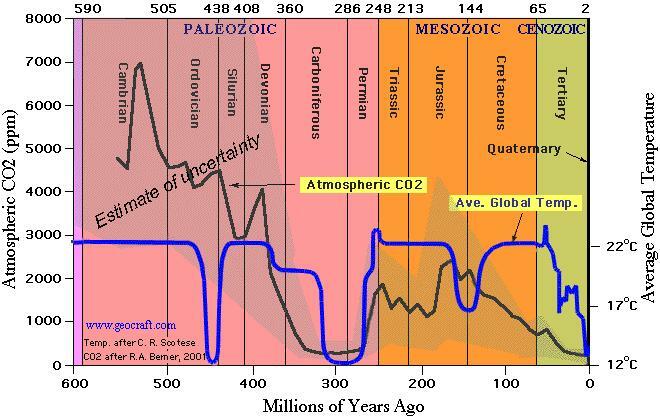 Can you define your understanding of “approximate” and explain what happened to upset that “approximate equilibrium” of atmospheric CO2 during the past 650K years? 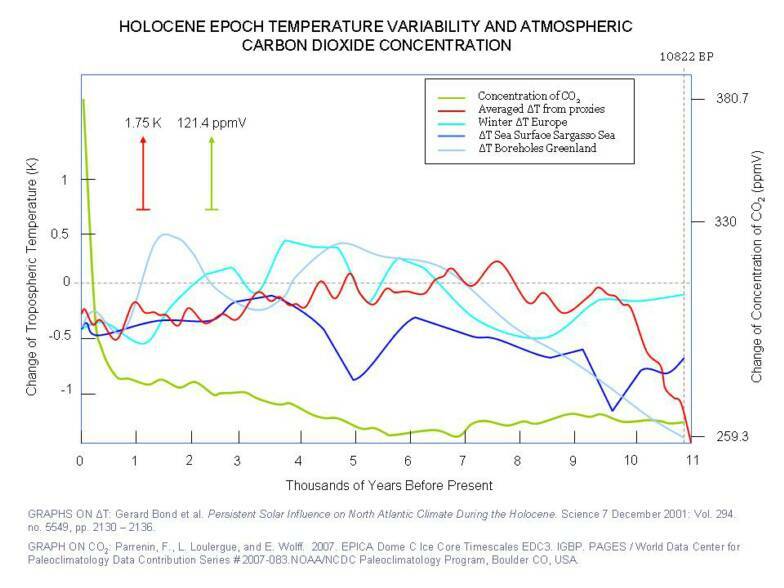 (http://www.realclimate.org/epica_co2_f4.jpeg) – note that the graphs are from your favourite source of science, Realclimate. Also, can you please provide that “ .. figure for the error .. ”? Not that I expect you to give me an answer to these questions either. I am forced to conclude that trying to have a worthwhile discussion with you is a waste of time so I’ll get back to exchanging opinions with ice core “experts” like Professors Jeff Severinghaus, Richard Alley, Hartmut Frank, Zbiniew Jaworowski, Euan Nisbet, Dr. Dominique Raynaud and others. I had a little time so I thought I was you and you the links to the scientific articles on climate change. Not all of the links came through so you might have to post the address into your browser window. Also, some of the papers are not available online, so you may have to go to the library to read them. Plass, G.N. (1956a). “The Carbon Dioxide Theory of Climatic Change.” Tellus 8: 140-54. Online here. Plass, G.N. (1956b). “The Influence of the 15 Band on the Atmospheric Infra-Red Cooling Rate.” Quarterly J. Royal Meteorological Society 82: 310-29. Plass, G.N. (1956c). “Infrared Radiation in the Atmosphere.” American J. Physics 24: 303-21. Plass, G.N. (1956d). “Carbon Dioxide and the Climate.” American Scientist 44: 302-16, online with commentary here. Plass, G.N. (1956e). “Effect of Carbon Dioxide Variations on Climate.” American J. Physics 24: 376-87. Plass, G.N. (1959). “Carbon Dioxide and Climate.” Scientific American, July, pp. 41-47. Plass, G.N., and L.D. Kaplan (1961). Exchange of Letters. Tellus 13: 296-302. Thankyou for your answer to my comment. I have spent some time exploring some of the references you gave me. I am familiar with the histpry of AGW theory thank you. However any empirical conclusions have yet to emerge past the laboratory. Kiehl measures the Earth’s mean energy budget. All very interesting but forgive me if I cannot see the relevance to our conversation. Alas Lacis et al are simply exercising some sort of climatary model in order to gain their conclusions. You must know better than this! Models are simply hypothesis’ and enable the scientist to see the effect IF that hypothesis is true. 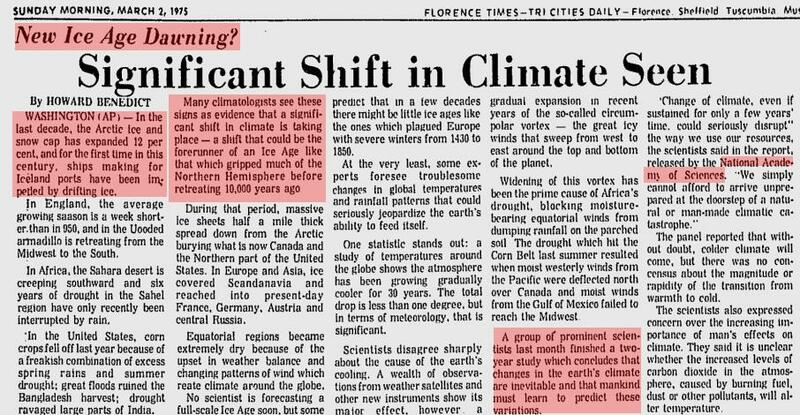 This is not even close to proof, it is simply scientific speculation as you must well know! I also read Plass’s paper. I am not very impressed. First of all he presents the whole paper as a hypothesis, or as he puts it, a theory. In that he is absolutely correct. study of the H,O spectrum has been made. the ratio of the new to the old values. and as far as I can see, no consideration of radiation into space on clear nights. Neither reflection of solar energy from clouds back into space. in fact none or little mention of the effect of clouds on atmospheric temperature at all. Neither Plass or any other of your links addresses any reasons for previous recent warmings. For a start, in order to even approach a scientific proof for the current warming (if thats what we actually are experiencing) very good papers analysing previous warmings, at least the three or four in historic times, are necessary. And these would need to definitively show that they were not caused by something that could be happening at the present. This has to be the first neccesary condition, unless there is some empirical evidence that effectively rules out any other cause of the supposed current warming. So there we are back to the original deficiency in the AGW theory. All that science has is some sort of correlation between CO2 levels and climatic mean temperatures. A correlation would be another necessary condition, but in itself is meaningless. Of course this may explain the fighting over world temperature analysis’s. Whilst looking for changes that are greater than the coefficient of error in the statistics looks fairly pathetic to me, it is the one possible necessary condition that exists, which would explain the pains that have been taken to try and create a believable and supporting dataset. However, if we are going to ruin our economies on account of AGW, there is no doubt in my mind that we need an awful lot more than a possible correlation for a reason to risk poverty and starvation. Thank you for carefully considering the references. I am writing an article that may, or may not, answer some of your questions. 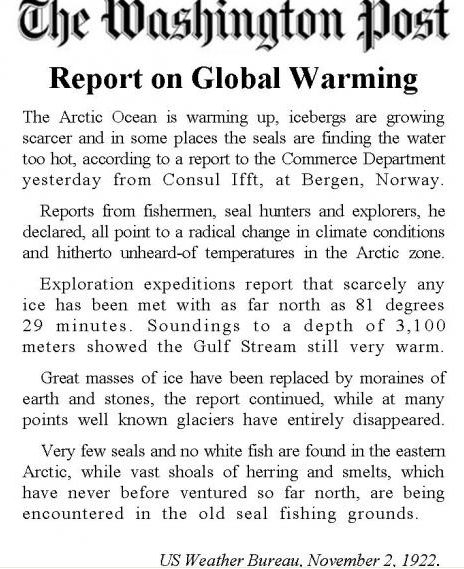 In the meantime, I have posted a short article about the Arctic sea ice at http://jcmooreonline.com/2011/09/23/bits-and-pieces-11-the-arctic-sea-ice-is-disappearing/ if you are intersted in that topic. I see that you have not posted the data that I sent you. If you’re going to control the flow of information on your site, then I would suggest that we both move our post to a neutral site, such as Newsvine. You may look it up on Google and it is free to join the site. A number of skeptics and scientists alike post on the site so you might find it interesting to participate in the discussions. I have about 30 articles on my site pertaining to the science of climate change and each article has a number of scientific references. My time is been rather limited lately by illness in the family , so I would suggest that you and your readers check my site at JCMooreonline.com. If they will put the topic in the search box, then the related articles with the scientific references can be found. The links you gave me are still in the comment below where the public can access them. I would have thought that is sufficient for the purposes of our conversation. Sorry about the illness in your family, but things may move forward some if you use, what time you hav,e to address my questions. I assume that you are familiar with the ice core data, which also provides records of dust particles and methane. Obviously, you cannot tell the water from a feedback loop from any other water in the ice. However, the vapor pressure of water depends only on the temperature, and if you look at the vapor pressure/temperature graph you can just look up on the chart how much additional water vapor would be in the air. You said on the Chimalaya site that you are interested in the scientific data. I have sent you references to the data , but perhaps you have not yet time time to post it yet. Please do so and then we can discuss it.